So you got your dream job: CMO of A Very Cool Brand. It’s your first day, and you can’t wait to make some really big things happen. But where do you even start? I like to think of this in terms of professional golfers walking the golf course before they tee off for their first round. It’s just a smart way to prepare. In order to have the right strategies in place (and the right corresponding tactics), you have to know what you are working with — and whom you’re trying to reach. LeadMD Vice President of Strategy, JT Bricker goes deeper into the strategic steps of a new CMO in The Marketing Insider article, “Your First Day As CMO: 3 Strategic s Steps To Take.” Read the full article here. As a strategic marketing leader, J.T. leads teams in helping clients design and execute actionable marketing and sales strategies and impactful execution that drive revenue growth and profitability. He works closely with organizations to develop a strategically grounded approach to marketing and sales with a blend of strategy, analytics, technology and creative to achieve growth objectives. J.T. 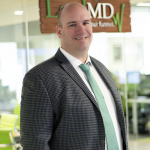 works with the LeadMD team in advising clients on best practices in revenue growth strategies, strategic sales and marketing alignment, account-based strategies, demand generation, marketing technology, marketing operations, analytics and sales management. Prior to joining LeadMD, J.T. held a variety of marketing leadership and strategic consulting roles including management consultant, marketing operations, pricing and offer management, demand generation and analytics in multiple enterprise organizations.